CyberTuner got a minor update. I'm only including it here because if you're on the fence about buying a $1,000 piano tuner... this is definitely the time to get it before Apple takes away my commission. Improved Auto-Renew CyberCare interface and messaging. Pure 12ths tuning style improved low bass. Fixed rare crash in CyberEar. Minor interface and bug fixes. Thats pretty funny 😆 As a Steinway grand piano owner since 1961 (Model M) I've never seen any of the top piano tuners here in Los Angeles use anything but a pitch fork and tuning hammer. I HAVE had a couple tuners over the course of those years show up with a strobe tuner .. and their work sucked. I sold pianos for a year at Pacific Piano in Orange County, CA, and our resident tuner who was obviously constantly tuning pianos in the store day in day out only used a tuning fork and hammer. 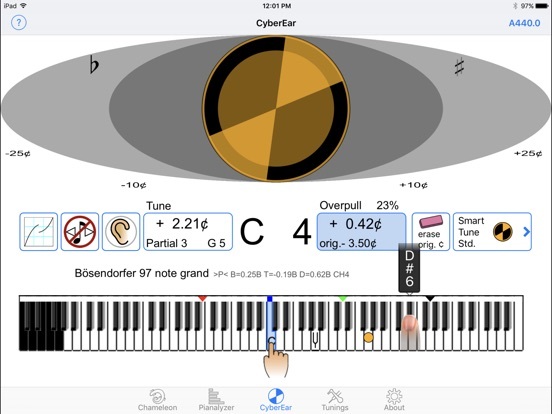 Not sure who would buy this app in my circles .. but the app has a 5 star rating and the reviews all seem to be from pro piano tuners .. so maybe there is more than meets the eye going on here .. but myself if I see a tuner show up here to tune the Steinway with an iPad I'm sending him away lol. That last two tuners I've used, both quite good, used some kind of app on a smart device for tuning. The results are very good, but both these tuners had very good technique with their tuning wrench. They knew how to set the pin so all the string tension was evened out across the bridge. I never asked what app they were using. But it wasn't just a strobe, it had some other stuff on the display. I've tuned using PitchLab ($3) which is impressively able to hear lower notes than the peterson strobe app. I have to do my own octave stretching (which pitch lab can kind of help with in one of its modes). BTW, if you don't know about PitchLab, it is THE best tuner I've ever used. Yes, I should have been more clear. The free version is fine, but what you get for the $3 is well worth it. There's a spectrum display that is fantastic. It could be a good tool for people wanting to improve their pitch matching and don't want to have anyone else in the room. You can swipe left/right to switch modes. And you can tap the screen to bring up an alternate version of the current mode. On the iPad version, you can split the screen. It's also available for Android, and it works equally well, though the mic on my phone tends to add harmonics (distorts) for louder sources, not a big problem. Downloaded it right away, something priced that high must be a super quality app!! !